The Largest most Impressive Collection of Frank Sinatra GENUINE Guaranteed AUTHENTIC Autographed Memorabilia & Rare Collectibles you will ever find! 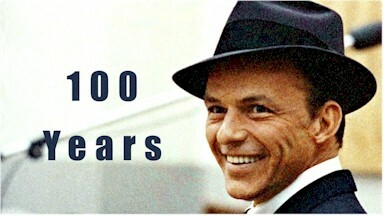 Considered by many to be the greatest entertainer of the 20th Century, "There will never be another Sinatra"
The Frank Sinatra biography, "Sinatra:The Life", describes Mr Sinatra as the story of an American icon who held the imagination of millions for more than fifty years and whose influence in popular music was unsurpassed in the twentieth century. Hence, be very cautious when considering buying a Frank Sinatra signed piece. Approximately 95% or more (no exaggeration) of the autographs on the market are secretarial (NOT personally signed by him but by his secretaries) or outright forgeries. 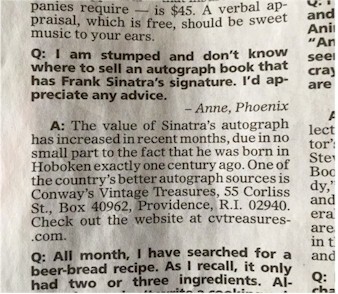 For example, I find about ONE out of 50 Frank Sinatra autographs on Ebay & other sites to be Authentic, the other 49 being fakes. This unfortunately is the case for most ALL valuable autographs being sold on Ebay & suspicious websites. Forgers have embraced the "un-policed" internet marketplace as a safe haven for their fraudulent operations. And COA's are worthless unless they come from a reputable source that guarantees authenticity for life. Rare Autographs from legendary figures like Frank Sinatra are incredibly valuable treasures to cherish for a lifetime. And, Authenticity is the foundation a rare autograph's value is based upon. So, only buy from someone with the knowledge, experience, and the solid track record to stand behind the integrity of everything he/she sells. HINT: One "red flag" of a seller of forgeries is often unrealistic low prices (since forgers don't buy autographs) and seller's inventory all suspiciously UN-inscribed. * One way to protect yourself from the risk of buying from a "questionable" dealer is to only buy from a UACC Registered Dealer as UACC Dealers MUST adhere to a strict code of conduct. It is important to note anyone selling fake autographs CAN NOT be a UACC Dealer. Accordingly it is no surprise you may encounter a "suspicious" dealer that disparages the UACC for obvious self-serving reasons. * Read our highly Popular (and valuable) Article "Ten Warning Signs a Dealer May Be Selling Autograph Forgeries" and the chances of you getting Scammed will be greatly diminished! We continue to build the largest, most amazing collection of original AUTHENTIC Frank Sinatra autographs and vintage treasures and we now have the largest AUTHENTIC Frank Sinatra autograph Collection you will find anywhere! I have personally collected and studied Frank Sinatra autographs for over 30 years. All of our autographs are backed with a 100% Lifetime Guarantee of authenticity. (along with unrealistic low prices) will be the dead giveaway. *After more than 30 years collecting and selling Authentic Frank Sinatra autographs and rare memorabilia we have acquired a highly respected level of expertise and reputation and are often consulted with and mentioned in the media all over the country. To the right is a recent article by a syndicated Collectibles columnist on the west coast..